Agbioscience . . .Ohio’s Future? A new word has been trending in Ohio, and it could be the solution to new and lifelong challenges facing humankind. Battelle, the world’s largest independent research and development organization is a main driving force for the use of “Agbioscience.” Ag-bio pulls together the use of advanced agricultural inputs such as farm products and processing to produce more wholesome foods and be used as a host for industrial and commercial goods. For Ohio this means jobs and who doesn’t love jobs? Energy jobs could be come of this too. A study done by the federal government states homegrown plant material could replace 60 percent of our nation’s oil consumption. With Battelle estimating two-thirds of the petroleum based chemicals in some 50,000 products could be replaced by farm products. This is huge; we could one day be the ones exporting our products instead of importing. 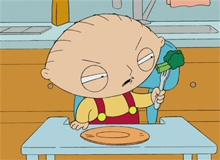 I recently watched an episode of Family Guy on Netflix and saw a portion where a young boy (Stewie) did not want to eat the broccoli given to him by his mother. His plan quickly became destroying the broccoli. The young boy found an article in a magazine that showed how extreme cold could kill the broccoli. Being in a plant pathology course, this quickly caught my eye. It is not common to see plant problems/diseases in cartoons. However, I believe it would be beneficial if cartoon makers would implement them more. I believe that much of the adult public is scared of various food modifications (Genetically Modified Organisms, GMOs) because of all the bad articles they read on the internet. This, in turn might translates to the children being afraid at a young age because of what they may have learned from their parents. If the media did more to educate the public, whether it is through cartoons, news, or the internet, I believe that much of the public would be less afraid of the idea of GMOs. I know that being in a plant pathology class and seeing how GMOs really work have made me more accepting of them. Many people may not understand that GMOs are not associated with a myriad of chemicals. I know members of my family have told me that they are afraid because they believe that GM (Genetically Modified) foods have a lot of chemicals within them and are dangerous to their health. The media is very powerful and with its help, the world of GM foods could go from feared to followed. Killing millions of ash trees in North America and endangering the other 7.5 billion, the emerald ash rorer is a lethal insect. It is a tragedy what these malignant creatures do to Mother Nature’s beauty, but it hurts me personally when they turn a majestic golf course into an eyesore. I bet you are picturing this ugly thing munching away on trees like I imagined, but in fact, it is their larva (babies) that do the fatal damage. The adults only nibble on the foliage while the larva eats the inside of the ash tree. The tree then has trouble transporting water and nutrients and eventually will die. Coming to North America in 2002, it was an unexpected and unpleasant intruder. 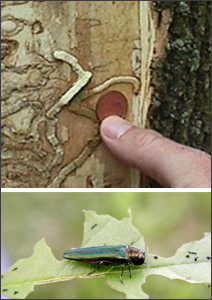 Discovered in Michigan, the emerald ash borer has taken its toll. Many golf courses have a significant amount of Ash trees, an unfortunately now, some do not. I have been to several golf courses in Ohio that have been affected by the deadly bug. Instead of perfectly manicured fairways and rough, there are piles of lumber and dead grass where it once sat. The smell of bonfire is overwhelming while the ash tree is being burned only a 9-iron away. If you were a golf course designer, or anyone planting a tree at that matter, would you choose to grow an ash tree knowing what could happen? I doubt that golf course designers are electing to plant ash trees near the areas where the bug has been discovered. What does this mean for the future of the ash tree? As part of the 2014 Farm Bill, a large bundle of policy that addresses subsidies for food and agriculture, farm insurance and federal agriculture stimulus, Congress announced a $52 million spending increase to promote local and organic farming. The stimulus includes a large portion for setting up the local industry, and the remaining funds for scientific research in the field of organic and small­scale agriculture. This kind of attention to more than just large-scale farms by the federal government is a step forward for promoting the local and domestic economies. Much of the money provided will help promote food production in underserved populations and geographical regions, helping alleviate hunger in the most needy areas. Additionally, the spending rewards those who run farms that support the local food supply. It is crucial to address local agriculture specifically, because unlike large commercial producers, local farms do not export food overseas and out of the domestic market. Keeping local food for local markets cuts down on costs for produce in stores, which benefits the American consumer the most. The area in which public policy can provide the most benefit to the agriculture sector is through market diversification: different types and sizes of producers can complement each other and maximize production of high­quality food for local and national economies. The government can play a big role in making sure these sectors flourish in the modern era. As a student whose primary focus is political science and economics, rather than plant pathology, it will come as no surprise when I say that my interest in agribusiness is a balance between the foundational science and business ethics. Companies such as Monsanto have been spotlighted frequently in the media for what some would call shady business practices that threaten to monopolize the food industry. In recent years, the Supreme Court even agreed to hear a case on the matter. The national news story can be found here. Frustration with these practices has produced popular criticisms, which may increase the vehemence with which groups protest the production and sale of genetically modified crops. However, do these business practices negate the science behind genetically modified crops? Regardless of one’s opinion on the way Monsanto does business, consideration should be given to value of genetically modified crops to produce higher yields and better crops. Many such plants are pesticide resistant, or more specifically, herbicide-tolerant (for weed management), contain nutrients not found naturally, or provide a variety of other traits that can help sustain our ever-growing population. Plant science holds the key to the future, but to what extent should policy makers be involved in the process? Currently, the FDA regulations on GMO crops are “relaxed”, promoting research and development while simultaneously protecting people from potential harm caused by allergens. In contrast, the European Union has prevented the sale of GMOs within its borders, although a recent ruling will discontinue this practice and allow countries to decide for themselves whether or not to allow GMO crops. These sorts of policy questions are important to consider as plant pathologists, biotechnologists, and engineers move forward with research into potential advancements in the field of agribusiness. Genetically Modified Organisms (GMO) is a term that we hear a lot these days – usually we hear about the problems with GMO’s. We hear about how they can cause numerous health problems, like cancer or you could insert any other disease and I’m sure GMO’s have been blamed. In my mind the media has jumped on the bandwagon with those the people against GMO’s. The average consumer has also let emotions make the decisions, more than logic. I believe though what the real problem is that the public is not informed what GMO’s are. I saw a segment on Jimmy Kimmel Live were he sent a group to go out and ask people about GMO’s at a local farmers market. Out of all the people on the segment that were asked only one person knew what the letters GMO stood for. None of them knew really what GMO’s are; mainly their response was they are something bad. One man even said that he avoids them because he gets bad vibes about them. This segment shows what the problem really is; it is that the public is uninformed about their food. This is what I believe is the real problem that we face in trying to get GMO’s to have less of a negative connotation. As an industry , growers and producers need to be more transparent with their practices and need to educate the public on what their food really is. As a grower, though , I know how tough this can be. The U.S. Department of Agriculture approved the first genetically modified apples – Artic® apples, grown by Okanagan Specialty Fruits in Canada. The very interesting part of these apples is that when they are bruised or cut they do not brown. These apples were approved after going through an assessment that found genetically engineered apples were unlikely to pose a plant risk to agriculture and other plants in the United States. Many genetically modified foods that we eat are engineered to deter insects, or survive herbicide (weed killer) treatment for weed management, but these apples are the first foods being directed towards the consumers and their needs and wants. I think that this is a great idea for the people to be able to use because the apples will be able to last longer. Everyone should love this idea because it will give them more time to eat their food instead of having to throw out the wasted food. This will let people to be able to get their money’s worth and everyone loves saving money. This article also shows the science that we have at our disposal. we have the ability to genetically modify apples to make them last longer so if we continue on this path who knows where the possibilities will end. Organic Crops: Are they meeting your expectations? USDA organic guidelines do not allow the use of irradiation, most synthetic fertilizers, prohibited pesticides, sewage sludge, or genetically modified organisms. There are pretty strict guidelines to be “Certified Organic,” and operations must be properly accredited; a process that is both time consuming and costly. But is everything what you expected? Or are there some surprising standard practices? While most synthetic materials are avoided, farmers may use approved chemicals during organic crop growth. Interestingly, high concentrations of chemicals are allowed in wash water, as long as a final rinse is a low concentration. In addition, plastic and synthetic mulches are allowed if they are removed from fields after the harvesting season. Strangely, the disposal of these non-biodegradable materials does not seem to be mentioned. Organic Certifying Agents are required to do periodic residue testing, but only on a minimum of 5% of the operations they are responsible for certifying. With more effort on prevention, this is understandable. However, this may mean that accidental contamination could go unnoticed for some time. Manures from conventional operations, including livestock fed genetically engineered ingredients, are allowed for organic crop fertilizer. While it is mentioned that herbicide residue is possible, manures are suggested for residue testing only if contamination is suspected in excessive amounts. This seems odd considering the firm stance against these for general use in organic production. Organic means “protecting natural resources, conserving biodiversity, and only using approved substances.” But beyond the motto, details are important. Consumers should research terms and procedures and make educated decisions to be confident they support their purchases. Putting Rice on Full Blast? The pathogen at the stand is Magnoporthe oryzae, or the causal agent of rice blast disease. Its crime? Magnoporthe oryzae is the leading pathogen in cultivated rice. With rice being a major global food crop, rice blast disease is global threat. This disease creates losses of 10%-30% globally, and outbreaks of this can cause regional epidemics that lead to starvation. An example of this would be the Irish Potato Famine, where the only staple crop of a region was destroyed by a pathogen, leading to the epidemic. Magnoporthe oryzae should be stopped, shouldn’t it? Easier said than done. The pathogen is relatively easily modified on a molecular or genetic scale, thus enabling scientists to study host-fungal pathogen interactions. There are now several cultivars that are resistant to the pathogen in circulation. These cultivars prove ineffective in the long term, however, as the pathogen can overcome the resistance in as little as 2-3 years. The mutation and combination rate of Magnoporthe oryzae proves makes it to be an elusive foe for scientists. Over the last 6 years, genomic resources for the disease and related species have increased and now includes more than 30 strains globally. This data shows many differences among the strains in gene content and organization of repetitive elements, meaning that they infect, and attack plants differently from one another. We can only hope, with the help of new sequencing technologies, that we can find insight into creating more resistant hosts to this deadly global pathogen. Reading through this article opened my eyes to the new standard that anti-GMO (Genetically Modified Organisms) activists are willing to fall to so that they can further their fear campaign. The USRTK (United States Right To Know) group has asked pro-GMO scientists across the United States to disclose records of their communication with GE companies. For good reason scientists are scared to present this information due to the USRTK being known to smear the reputations of people that oppose what they believe is truth. Scientists have conducted research that disproves anti-GMO concerns and aided biotech companies in furthering their progress with making better crops. The USRTK wants to take the information of the scientist’s involvement with GE companies and say that the scientists are hiding secrets about the dangers behind GMO’s. This smear campaign is just another low attempt by anti-GMO activists to promote organic farming and further the false idea that GMO’s can cause health problems for the people that consume them. By asking scientists to disclose information, just so they can smear their reputation, this puts scientists in a catch twenty-two because if they cooperate they get smeared, but if they don’t the USRTK says they are hiding something and smear them anyway. I don’t know what advice I could give scientists because they are in a very tough spot. Many universities are advising their scientists to refuse the request to present information and I think this is the best possible situation for the scientists. By refusing the request they can still publish factual findings without this fear group smearing their good name.